Heat a 5-6 quart Dutch Oven or heavy bottomed pot on medium heat, then add the oil ( or water or veggie stock), diced onion and a pinch of salt and pepper. Cook for 5 minutes, stirring occasionally. Next add in the garlic, peppers and celery and cook for 5-7 minutes, until veggies are softening, stirring a few times. Now add the rest of ingredients to the pot and stir. Bring the Chili to a boil then reduce the heat to a simmer and cover for 25 minutes. Stir once or twice. After 25 minutes uncover the Chili and add one soup ladle full of Chili to your Nutra Bullet or Blender and blend until smooth. Add the puree back to the Chili. Stir and Serve. Enjoy the Chili by itself or serve with your favourite toppings! 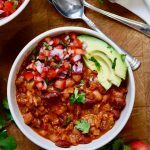 this Chili is SO good on a Vegan Hotdog with mustard and a little finely diced white onion! I have made my Chili with Fire Roasted Tomatoes and regular Diced Tomatoes, they’re equally delicious. If you use Seasoned Fire Roasted Tomatoes omit the onion powder and granulated garlic. feel free to add your favourite vegan crumbles, 1/2 a cup or so. If you use TVP I recommend pre soaking it. Once in awhile I will add cooked, crumbled tofu to my Chili. I crumble the tofu into a good quality non stick skillet with a few spices and cook on medium heat for 20 minutes. It’s a great ‘Meaty’ addition.